The new text analytics capability gives users the ability to uncover insights from the text entered in unstructured entry fields that may not be surfaced by forms. Presented as a word cloud visualization, text analytics lets users zero in on specific words, view trending over time, pinpoint associations between keywords, and then take action by drilling down into records. 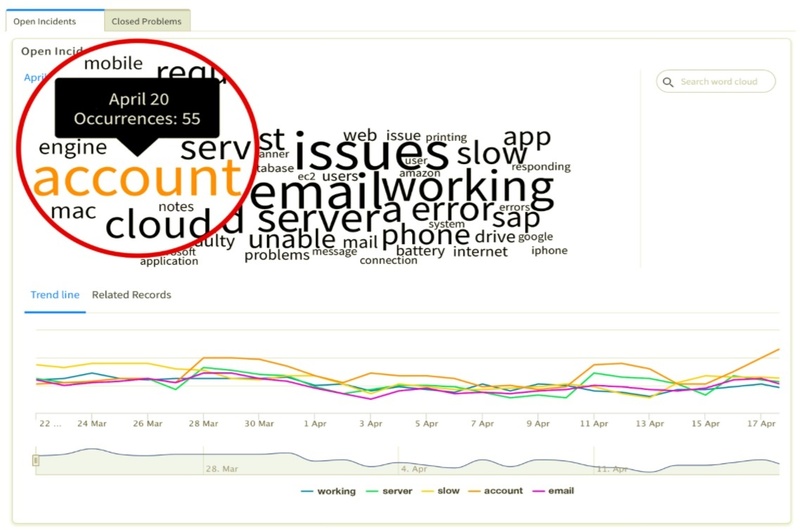 For example, the word cloud in the screenshot shows “account” as showing up frequently in the description field in a high number of open incidents. A user drilling down on the word “account” to the underlying records might discover that there are a high number of users who are having account log in issues – thus easily identifying a trending issue. As our customers continue to expand their investment in the Now Platform with additional solutions (ITSM, ITOM, ITBM, SAM, HR, Customer Service Management, Security Operations, and even custom apps), Performance Analytics administrators need a single entry point with easy access to all of the relevant content and information under their domain. The new Analytics Admin Console is a single page entry point to bring all administrative content together in a single interface for creating and managing content, as well as information on existing setup and health checks. Tiles such as Get Started, Manage, Troubleshoot, Usage, Advanced Configurations, and Get Help provide users with a clear path to accomplish all of their administrative analytics tasks on the Now Platform. In order to take advantage of the Performance Analytics capabilities in the Now Platform, users often need to import data from third party sources. In Jakarta, we added .xlsx import. Now in Kingston customers can collect data from MySQL, Oracle and SQL Server databases via the Java Database Connectivity (JDBC) API and take advantage of Performance Analytics functionality by using proprietary data in combination with ServiceNow indicators and breakdowns to create widgets in dashboards, set targets, and more.